A creative company with a refreshing outlook, Mac Decals offers dimension and vibrancy to the flat face of technology. The company regularly features promotions, special offers, and contests in order to thank its customers and promote popularity. This June, the company is launching a simple question to see what its audience likes the most. They’ve selected three macbook pro decals to choose from, as featured on their webpage. The decal that obtains the most votes will have all of its voters automatically enrolled in a free contest to win a MacBook decal of choice. The contest opens June 1st and ends on June 30th, 2012. Participants can simply log into their facebook account and “Like” their favorite of the three featured decals from the websites contest page. When the month is up, the voters of the winning decal will all be automatically enrolled into the contest. The three winners of the free MacBook decal will then be randomly selected and announced on the Facebook page. Mac Decals will also send a Facebook message to contact the winners. The company specializes in the creation of top-quality vinyl decals for all Apple products such as Laptop Stickers, Macbook Pro Decals + Stickers, iPhone, iMac, and iPod. Its creative designs, skins, and prints cover a variety of professions and preferences; from computer design and antique cars to animals and martinis, Mac Decals seems to promise something for everybody. On their Macbook decals + stickers website, the company promotes that it independently designs, creates, and sells its products, maintaining a genuine transaction. All stickers and decals come with clear transfer paper and step-by-step instructions that are available on the Mac Decals application page, ensuring easy application and removal or replacement. The high quality adhesive properties also prevent any residue upon removal. 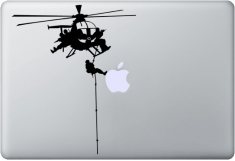 Mac Decals welcomes comments and questions at [email protected](dot)com. Best of luck!